This tutorial is based off my memory of the first time I installed ML (and how I put ML on any new card). Warning! Magic Lantern is not approved nor endorsed by Canon in any way, and using it will probably void your warranty. We are not responsible for any damages to your camera. ML does not install onto your camera, it runs off your card and is loaded every time you turn your camera on. If your 550Ds firmware version is not 1.0.9 you will need to update it (this has nothing to do with the Magic Lantern firmware version, this is the Canon firmware). Put your camera in "M" and switch it on (or switch it on first then put it to M, either way). Press the "menu" button on your camera (top left). Press the left arrow until you come to the 2nd last menu, this should be a spanner looking item with 3 dots. The bottom label should say "Firmware Ver." followed by some numbers. If your numbers are anything but "1.0.9" you will need to upgrade (or downgrade) to 1.0.9. (A downgrade would not be necessary as of yet as there is no newer firmware released by Canon). If you can't access the link (if it is region blocked or similar) go to google and search "Canon 550D firmware" and look for a link that comes from a .canon. site. When you're updated to 1.0.9 you can continue to the next step. This process should only be performed once (for each camera, if you have used ML before on the camera you are using then jump below to "The Second Install".). Make sure you are running Canon firmware 1.0.9. Copy ML files on the card and run Firmware Update. After installation, copy your ROM files (ML/LOGS on the card) to a safe place. Get your new (or old) SD card and insert it into your camera. Format the card in camera using a low level format (this will erase all content on the SD card). Updating ML is a simple process. First go to builds.magiclantern.fm and download the latest build by clicking on the drop-down box and selecting "550D.109". Turn your camera off, take out the SD card, and insert it into your computers SD card reader. Delete the "autoexec.bin" file and the "ML" folder off of the SD card. Now all you have to do is copy the new "autoexec.bin" file and the "ML" folder from your download across to the card, overwriting the old files. Put the card back in the camera and turn it on. If a feature you previously used in ML is not functioning as normal, either revert to the older nightly build you had on your camera, or go back to the download page and click "Show Older Builds" and choose one from yesterday or the day before. The majority of times the nightly builds are stable and it is rare that features break, if they do they are usually fixed within a couple of days (if not a day). If the nightly builds page is not working for you, try again the next day. If builds say that they have failed, click "Show Older Builds" and choose the most recent build that has not failed. Booting Without ML (is a simple process). If you want to boot your camera without ML, all you have to do is hold down the "SET" button while switching your camera "ON". Un-installing ML (is a simple process). It is not enough to simply delete ML off of your SD card, this will leave the bootflag on your card set and can potentially brick your camera (when booting from a card that has the bootflag set but no 'autoexec.bin' file). If you want to completely un-install ML, all you have to do is turn your camera on, press the "MENU" button, find "Format" in the 'first tool' menu. In format, see that "Low level format" is ticked by pressing the "delete" button, and select ok.
Be warned, formatting erases (deletes) everything on your card including all your pictures and videos, make sure you have taken them off your card first. It is an abbreviation for "Magic Lantern"
and that if you do need to update your cameras firmware to match that you use the Canon firmware that matches your camera. For relevant instructions to your camera you should find the specific cameras thread in the camera specific discussion board. --Explain the boot flag thingy again!? There are two bootflags; the Canon Camera bootflag, and the SD card bootflag. The Camera bootflag only gets set once. When you buy your camera it is set to 0 (off), when installing ML for the first time (using ML's .fir file) it sets the bootflag to 1 (on). 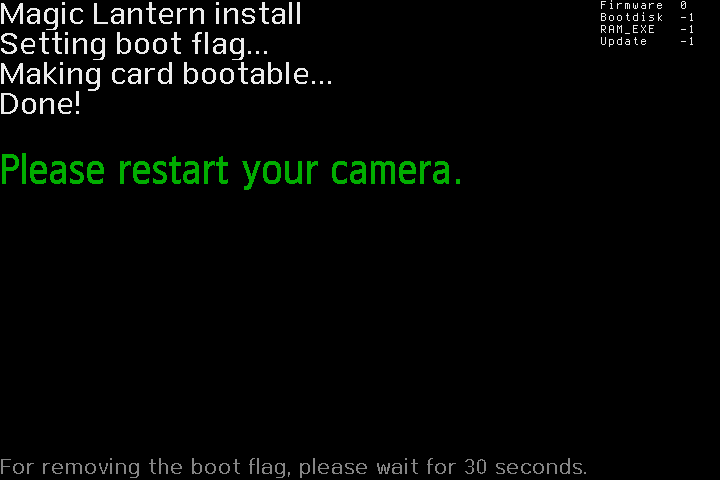 This allows SD cards which have the bootflag set to run the "autoexec.bin" file when the camera is turned on. The SD bootflag is removed when formatting the card. The SD card comes without a bootflag. The bootflag is written into the card header (something like that, I don't know the technicalities) into a specific location (using a separate program that can write a Canon/ML bootflag). There are many different bootflags that can be written into an SD card that are not compatible with Canon cameras, so the result will be that ML does not run. To set the bootflag on the SD card one needs "EOScard" (see links above). --How does I Raw recording?!?!!1! then into the "modules" menu, there you can enable "raw_rec" or "mlv_rec" to record raw video. Then after restarting your camera you should find raw recording in the movie menu. Sometimes better performance is achieved from the old format, the only way to truly know is to experiment yourself with it. --I can only record video up to "1728x1156" resolution. I can only agree with this statement. That is a limitation of the 550D. --My pictures/raws come out looking interlaced (they have lots of lines through them). You have enabled "dual_iso", go into the modules menu and turn it off. --My video is all flashy (every 2nd frame is bright). You have enabled HDR video, go into the movie menu and turn it off. HDR video is not raw recording (although can be used in conjunction with raw recording, but not in the case that you are after). --The latest build is not working correctly for me. See "Updating Magic Lantern" above. Register Maps need your support! A clean database is being made of the register maps and they need to be convert from the wikia. 550D has its own register map page and this needs to be converted into the new format. I'm planning to install Magic Lantern on to my 550 with Firm ware 1.0.9. For some reason I cannot install the Magic Lantern on to my camera. Could anyone help on this issue please?? I've misplaced my crystal ball. Do you mind sharing more information about your problem so I don't have to take random guesses about what the problem is? My 550D is arriving in the mail today and after I briefly play with it in "stock" form, I'm putting ML in it ASAP. I don't see much activity in discussing ML with the 550D here, apart from the tutorials above. Hopefully, if I run into questions, there is still enough interest in this model that I can draw upon the collective expertise of the community! Thanks in advance!! So I have a 550D as well with the updated canon firmware and the updated ML nightly build however I noticed that ever since I installed ML my camera would automatically either stop recording or shuts off. It's been happening a lot tonight after the update. I'd have to turn the switch back to the off position and wait for a minute or two before it turns back on. I also removed the battery and did the same steps again several times. Should I uninstall ML, reformat the SD card and restore everything to factory default and start all over again? It's really aggravating and I would love to start practicing with this camera before I buy a better model or something. Updated ML by "Copied new version over old version"? Or update as in "Deleted AUTOEXEC.BIN and ML directory and copied extracted nightly contents"? If first, try second and report results. I "Deleted AUTOEXEC.BIN and ML directory and copied extracted nightly contents". I started recording then I got the "Movie recording has been stopped automatically" again. I hit the record button and filmed for about 30 seconds then stopped. Camera then went completely blank until I kept pressing buttons and the red light started flashing and I heard the shutter noise (i think that's what it is or sound like) then it came back on. I'm using a Dane Elec SD class 10 32GB card if that makes any difference. None right now, everything is greyed out as I type this. Just to make sure: You recorded in Canon's H.264 (MOV) at the time the error occured? I believe so, I haven't made any changes other than updated the Canon firmware, set the movie exposure to Manual, turn of the Auto power off and it is set to record in 1920x1080 and the only changes I made in ML was turning on Cropmarks and plug in an external mic. Forgive, I'm still learning the terms and features of this camera and ML. I'm one of those that used this device to take pictures at random without messing with the settings and now I'm trying to learn how to shoot film. Just checked and saw the Bit Rate is at the 1.0 default setting if that is what you were asking about. Thanks for your input. I don't own a 550D. I think it's about time for a second 550D user to jump in if your problems are reproducable. I'm trying to Google and Youtube the problem, I haven't found anything to resolve it from this forum. First I'd like to apologise for not completing all the tutorials yet. What you need to do is grab the program EOScard (which I have included in the quick links up the top), run that on the card, so that the bootable flag is enabled, and then copy the new ML nightlies across. If your nightlies are a few days old now grab newer ones. But yeah, it seemed to be for me some sort of card problem where there was probably remnants of other files spread across the card so it couldn't write neatly and quickly. So for clarification, run the EOScard program after the reformat on the PC before reinstalling the ML? Reformat on PC _AND_ALSO_ low level format in camera, in that order both before EOScard. EOScard sets the bootflag on the card, telling the camera that autoexec.bin is on the card, formatting removes the flag, so running the format after the EOScard would remove the flag which you need (that wasn't meant to sound patronising, I was just elaborating (which this will soon be in my unfinished tutorials)). ALSO _important_, if you have run EOScard (if you have set the bootflag on the sd card) NEVER insert it into the camera without having "autoexec.bin" (and the ML folder) on the card. Because if it's not on the card the camera will still try to boot off the card which could damage or brick your camera. If you do happen to, turn your camera off and remove the battery, then take the SD card out (switching the camera off by the power usually does nothing, so you need to remove the battery to turn the power off). Ok, I will give it a shot and I will post the result. Thanks for the input. Well, I've completed the reformat and reinstall of the software and I was able to record for 30 seconds without any issues. I'll try to record longer tomorrow and post any updates. I'm looking for a ROM dump from a 550D to research how to unbrick a camera. Please send me ROM1.BIN from ML/LOGS by PM (it's already on your ML card if you are using the nightly). Autofocus doesn't seem to work, shutter count didn't change (or maybe you also have 80K clicks like me? ), otherwise camera seems to work normally. Reflashed back. Screen color back to normal, autofocus still not working. Maybe that's how the kit lens is supposed to work?! I've got the 50mm 1.8/f lens attached at the moment, and it was also the last lens used to take photos. Also there was a ROM0.BIN, is that anything needed? It was the exact same size. ROM0 is not connected on 550D (ROM backup code is generic, one size fits all). It's probably my kit lens defective (the motor only works in one direction, on any camera). Didn't try the lens before reflashing (it collects dust on the shelf). I don't have any other AF lens to try (my 50/1.8 is broken, only works in MF). So I want to uninstall ML from my camera and I followed the instructions on the wiki site but it still has ML on it and even after I reformat the card on the camera to include a low level format, ML restores itself. Any ideas? Run firmware upgrade and wait for 30 seconds after installation completes.